Allotment of Time, rules of the House of Commons, Standing Orders 115, 116 and 117, often confused by the media with the closure rule, S.O. 57. Since 1968 most bills pass the committee stage in the standing committees and may be amended at the report stage, but S.O. Parliamentary Procedure and Practice with an Introductory Account of the Origin and Growth of Parliamentary Institutions in the Dominion of Canada, by Sir John George Bourinot, Clerk of the Canadian House of Commons, was published in 1884, with 3 later editions in 1892, 1903 and 1916. 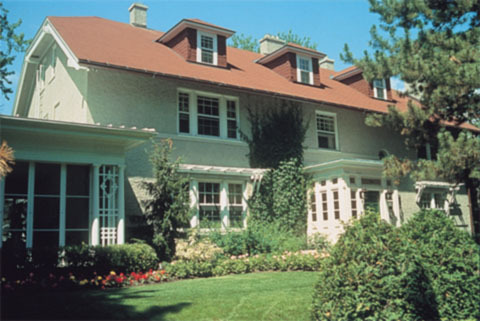 In Canada's parliamentary system of government, the Cabinet is the committee of ministers that holds executive power. 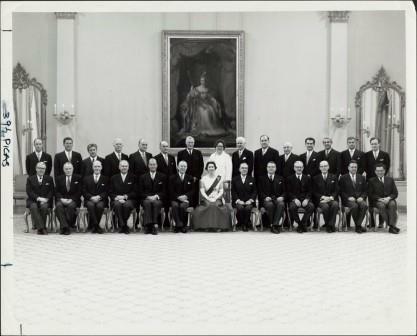 Cabinets are chaired by the Prime Minister (or in the provinces, by a premier) and ministers are most often elected politicians drawn from the party holding the most seats in the House of Commons (or the provincial legislature). Cabinets are traditionally strong, consensus-driven institutions, although some believe their influence is waning in the face of powerful prime ministers and their advisers. 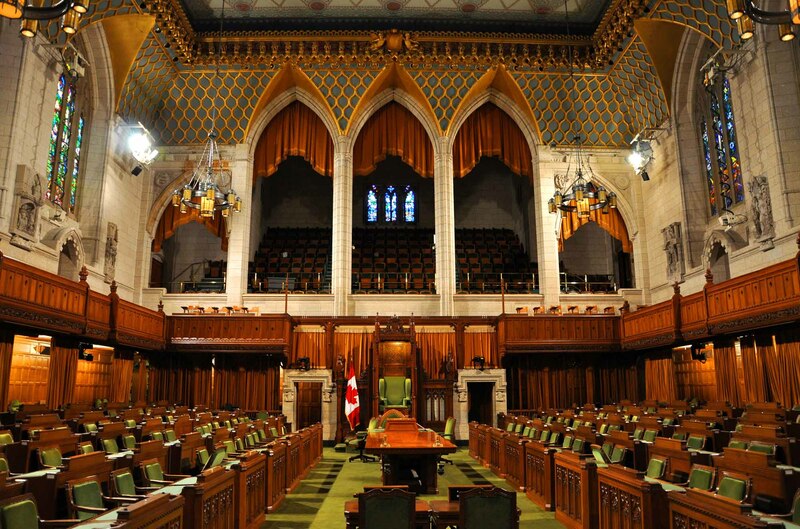 The Canadian Parliamentary Press Gallery (CPPG) is a self-governing corporation that consists of accredited journalists who cover Parliament and other Ottawa-based governmental organizations and institutions. On the weekend before he planned to shuffle his cabinet, Jean Chrétien was tired but in a teasing mood. The word was out well in advance of last week's cabinet shuffle that the heavy lifters - Finance Minister Paul Martin and Health Minister Allan Rock - were keeping their old jobs. As usual, the makeup of the cabinet sent out unmistakable signals about the government's priorities and intentions. In addition to Chrétien, there are 22 other Ontarians and Quebecers in the group, reflecting Liberal strength in the centre of the country. Closure is a procedural provision allowing the Government to curtail debate in the HOUSE OF COMMONS and bring on a vote. A remedy for FILIBUSTERING, it entails 2 different decisions by the House: the vote to apply closure, and then the vote (or votes) on the business being closed. Coalition governments are created when different political parties co-operate by forming a temporary alliance large enough to enjoy the confidence of Parliament, allowing them to form a government. 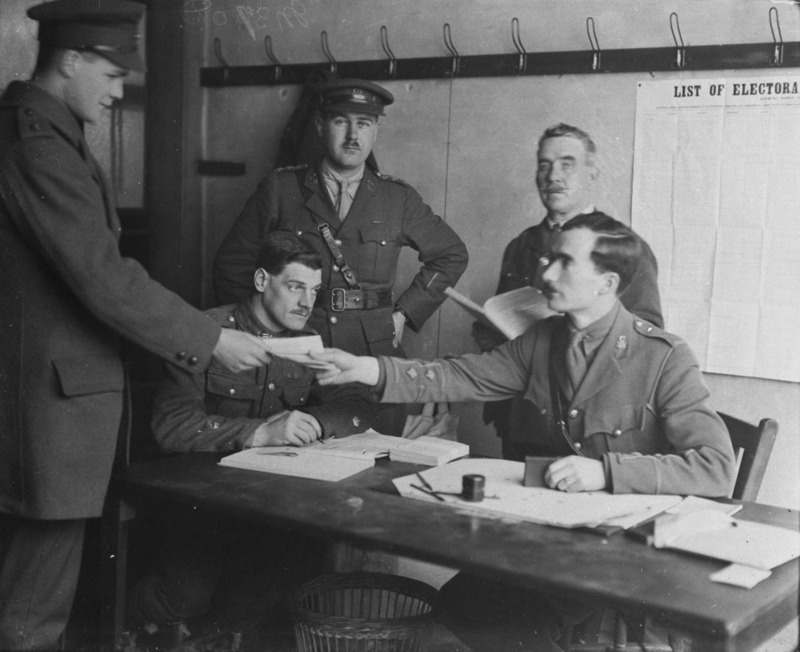 Members of all parties in the coalition are appointed to Cabinet. This sometimes happens when no single party has achieved a majority of seats in the House of Commons or provincial legislature. Federal coalitions normally appear during periods of crisis such as war or political breakdown. 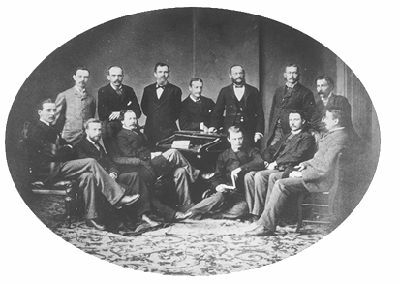 The strengthening of party affiliations and the development of the party system since Confederation has made coalitions more difficult to negotiate. Politicians have become wary of the long-term results of coalitions and are reluctant to introduce them. The Commission of Government in Newfoundland was established in response to an extraordinary set of circumstances. Parliament has many committees which perform functions that cannot be adequately accomplished in debate or question period. Filibuster, the use of delaying tactics, used most often by the Opposition, in a parliamentary body. Opposition filibusterers speak as often and as long as possible, raising many points of privilege and order to prevent votes they expect to lose. Hansard is the unofficial name of the record of parliamentary and legislative debates. The name comes from the Hansard family, which printed the British debates from 1812 to 1892. House Leader, nonofficial title of MP nominated by each party to serve as head strategist and tactician in the House of Commons. 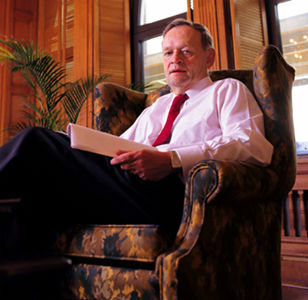 The government House leader, a Cabinet member with the honorific title of president of the Privy Council, negotiates among parties about the Commons timetable. By the Queen's Robing Room inside the Palace of Westminster, there is a small, sedate chamber they call the Norman Porch. It is populated entirely with busts of past luminaries of the House of Lords, each of whom has served as British prime minister. Following his investiture last week as Canadas 25th governor general, Roméo LeBlanc sent the customary short note to the Queen - his boss - to say that he had been sworn in, that everything had gone according to plan and to assure her of his "loyalty and devotion. The leader of the Opposition was first recognized by statute in 1905 and given the same salary and allowances as CABINET ministers. The leader of the Opposition is a parliamentarian hoping to become PRIME MINISTER and is the leading critic of government programs and policies. 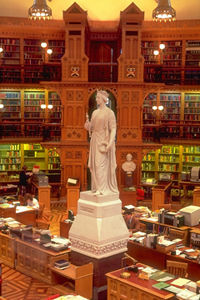 The Library of Parliament came into being when the legislative libraries of Upper and Lower Canada were amalgamated in 1841 and situated in Montréal. In 1849 only 200 of the 12,000 books were saved when an angry mob protesting the Rebellion Losses Bill set fire to the Parliament Buildings. 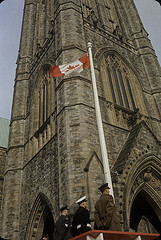 According to the Constitution Act, 1867, the term Parliament refers to the Crown, the Senate and the House of Commons — the institutions that together create Canadian laws. When Parliament is referred to in some formal usages, all three institutions are included. In common usage, however, the legislative branch of government — the House of Commons and the Senate — is often equated with Parliament.